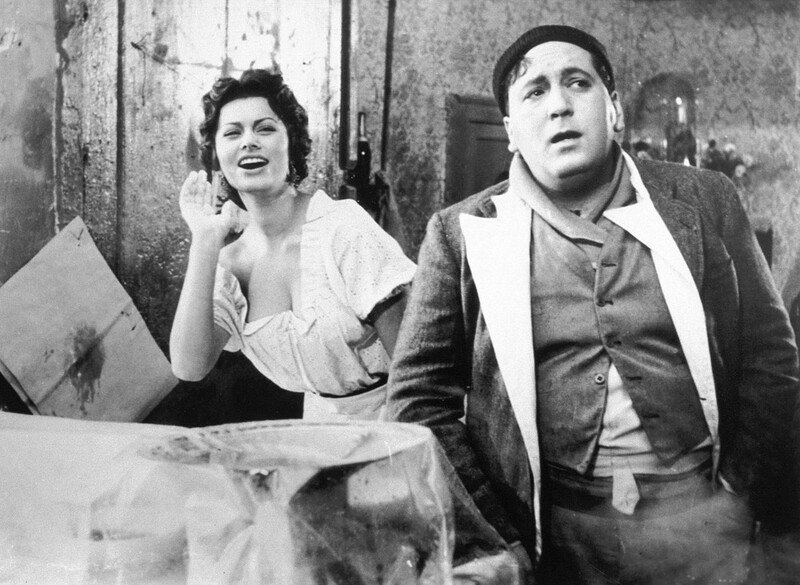 If you’re into Italian cinema, you might have seen it in the hands of Sophia Loren in Vittorio de Sica’s 1954 masterpiece “L’Oro di Napoli” (“The Gold of Naples”). In one of her first starring roles, a young Loren plays a pizza fritta maker who takes her husband to all of her customers’, on a quest for the engagement ring she pretends to have lost in the pizza dough. The movie chapter is set in one of the most popular neighbourhoods of the historical city, and is entitled “Pizza On Credit”, referring to the old Neapolitan tradition of pizza oggi a otto (literally “eight-days-from-now pizza”). All through the war and in post-war times, the Neapolitan working-class struggled to make ends meet. Poverty was deep and there was shortage of everything. Food items such as mozzarella and tomato became a luxury. 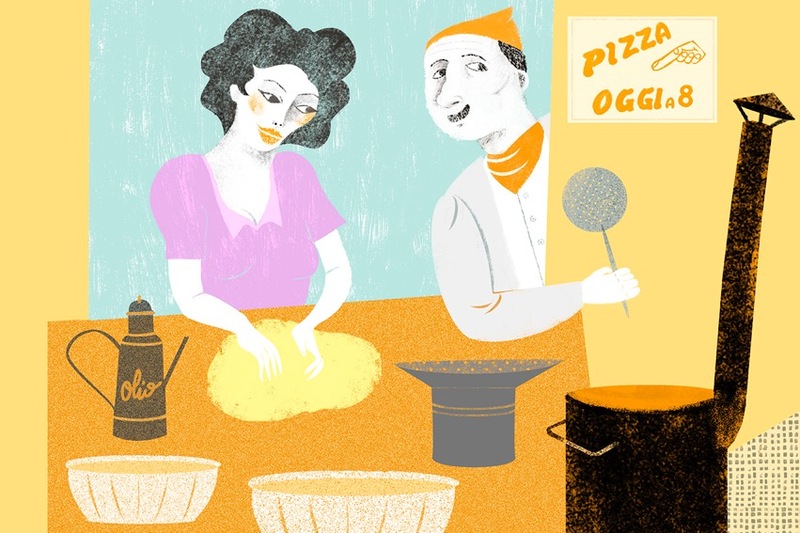 Few people could afford heating a wood-fired oven, so it became customary for households living on ground-floor dwellings overlooking streets and alleys to embark in the fried pizza business. Neapolitan pizza fritta is made with exactly the same dough as the oven-baked one, no fats or sugar added. It came in different versions and could be stuffed with almost anything at hand, from endive to meat and cheese scraps, but it could also be eaten plain and empty, or topped with a spoonful of tomato sauce, cheese and basil (this latter version being called pizza montanara). Frying oil was relatively affordable and didn’t require the manpower required to clean, fuel and maintain dome ovens. It became quite common to see women sitting outside their homes, selling pizza to neighbours and passers-by who, in an interesting example of community solidarity in dire times, were allowed to pay in eight days. It was a mutual support system based on trust and on the hope that loyal customers would come back to pay and buy more pizzas. The same village feel can be found to this date in popular neighbourhoods, like via dei Tribunali, an old street built on the remains of the ancient Greek and Roman decumani, and home to the most authentic pizza places in town. The local pizzaioli are known and called by their first names in the whole neighbourhood. The most famous of them is Gino Sorbillo, whose reputation spread nationwide with his participation in many TV cooking shows. As Soup As Possible interviewed him about pizza fritta, a tradition he is trying to spread beyond the borders of Naples. Although his business grew exponentially in recent years, leading to opening more restaurants in town and one pizza fritta place in Milano, and to him being busy with events and gigs all around Italy, Gino left his heart in via dei Tribunali, where he grew up, and still works there taking pride in making what many Neapolitans consider the most delicious pizza in town, helped by his brother Toto. The Sorbillos are a pizzaioli family since the Thirties. 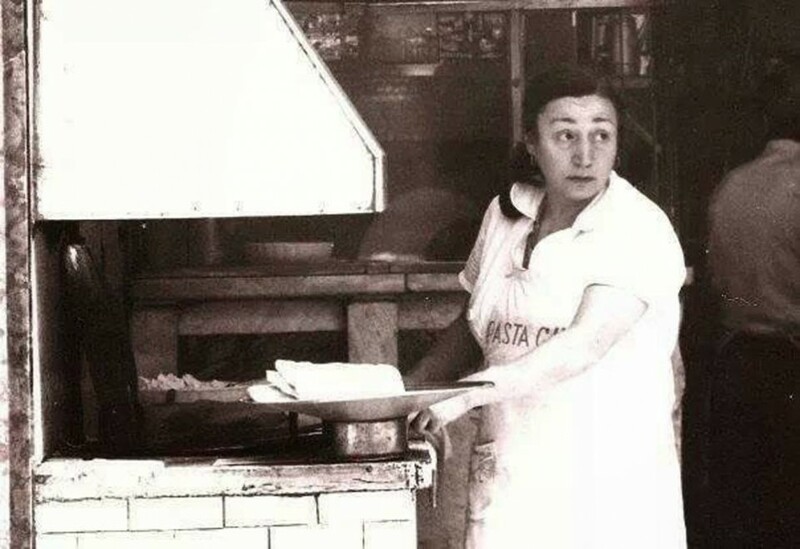 Luigi and Carolina, Gino’s grandparents, were both pizza-makers, making respectively round oven-baked pizza and fried pizza (Sophia style). They both passed away in the Sixties, leaving 21 children. Esterina, the elder of them, took care of the whole family, taking over the pizza business, where she had worked since she was a teenager. All of the 21 kids became pizza-makers and they are all remembered in the menu of Sorbillo’s pizzeria in via dei Tribunali 32, with pizzas named after each one of them. Gino never met his grandparents, and beloved aunt Esterina, despite her strict temperament, became a charismatic presence in his life. 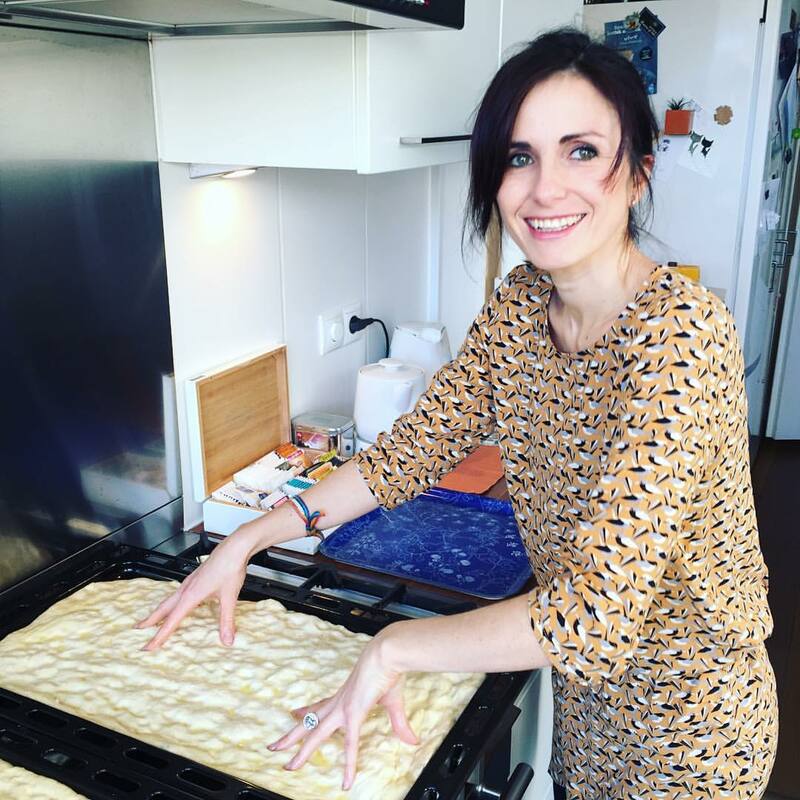 Gino transformed Esterina’s former apartment, above her own small pizza fritta place and next door to Gino’s, into a sort of pizza sanctuary he calls “casa della pizza”. That’s where he meets me, exhausted from a working day at the pizzeria, but radiating enthusiasm as he shows me around. The place is filled with gadgets, collections and memorabilia that tell the story of his family through yellowing newspaper articles, family portraits and countless copper oil cruets. A photo of auntie Esterina peeking out of the window is installed on one of the wooden window shutters, as if she was still overlooking her via dei Tribunali. The small kitchen features a miniature wood-fired oven where Gino tests new recipes. “Being the son of number 19, I have worked a lot on innovating our tradition and reinterpreting in a contemporary spirit what I had in my heart: a story made of sacrifice, hardships, waits”. 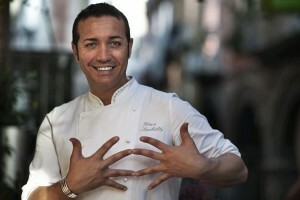 In recent years Gino committed to showing the world that a pizzaiolo is no second class cook. By the following he has gathered and the prestige he has gained even in the “aristocracy” of Italian cooks, you would say he definitely succeeded. He is currently trying to bring pizza fritta to the world’s palates and attention (his next pizza fritta place is opening soon in New York). He lightens up as he explains that pizza fritta is prepared on the moment, cooks in forty seconds and is eaten right after cooking. Customers must be able to see the pizzaiolo make it, so to anticipate the pleasure and taste that’s coming their way. Gino has been using organic ingredients in his pizza for over two years now. “I like the unpredictability of organic products. They are harder to manage but provide the challenges I need to keep improving my whole process and product”. He doesn’t like shortcuts: Sorbillo’s pizza is based on “weak” flours and rises for 10-12 hours with no refrigeration involved. “Our complexity is in keeping it simple, there’s no hidden secret in Sorbillo’s pizza. I have always believed that Sorbillo’s pizza must be a delicate product, good and light, and it can afford some variability. It’s a human-made product, we don’t like to measure our pizzas to make them perfectly round. They need to be equally good and tasty every day, of course, but not identically shaped. To me, pizza is like a blank canvas where I can impress my mood and feelings, always gently, but with some variation”. The cover picture of this article was created for As Soup As Possible by Alessandra Vitelli. 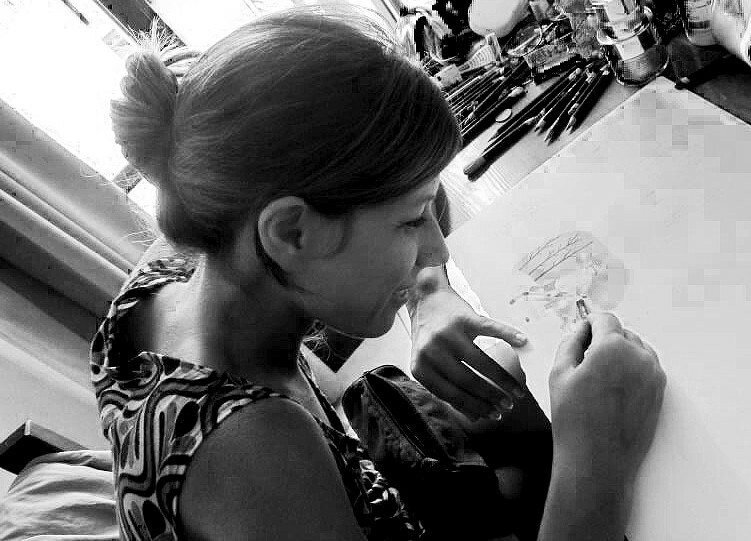 Alessandra is a published illustrator and illustration teacher with over fifteen years experience. Her work is inspired by nature and creates dreamy and colourful atmospheres, sometimes even using unexpected materials, like coffee. Alessandra Vitelli lives and works in Naples. To see more of her work, view her portfolio.